Antennas: depends of the frequency, range and material. 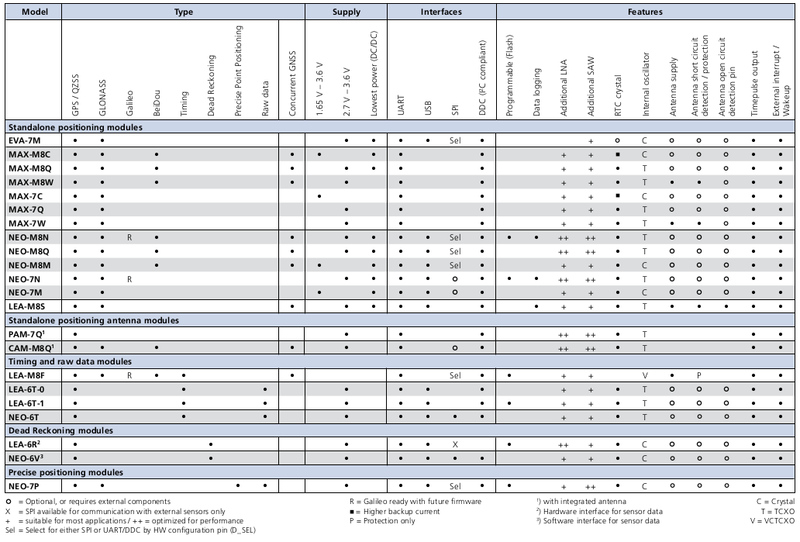 Interfaces: UART, USB, SPI, I2C, etc. Availability: fast delivery, warranty, support and documentation. There are more features that can be taking into account, however we proceed with those mentioned above, to explore the huge market of GPS Modules and choose the most convenient for our needs. Some of the most representative manufactures in the GPS tracking business can be find on this guide here. Very stable and good performance. Signal acquisition is one of the fastest in the market. Signal accuracy is among the top of the market. All u-blox modules are standalone, meaning they provide a position without the need for host integration or extra RF components. 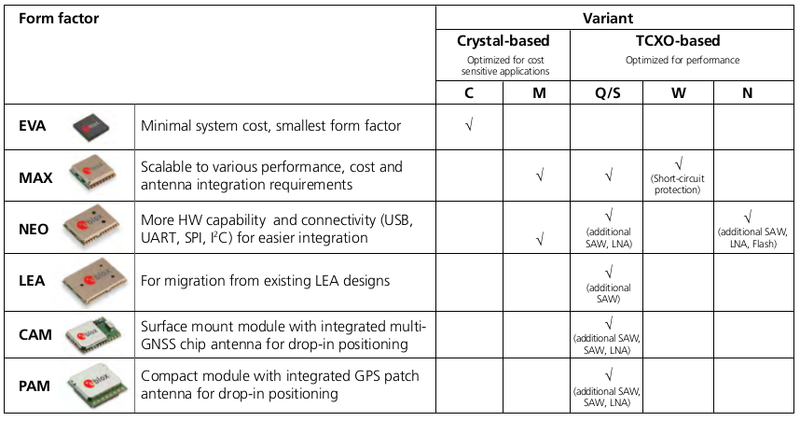 Offers not more than one type of GNSS. For our system why are looking the best performance of the tracking system during the fly, this one can be achieved using the platform M8, however there is the drawback of high power and cost, but for our application where increase the power supply is possible due we have enough place to increase a bit the size of the battery and the module ColibriT20 on the Iris Carrier Board has wide power supply range 5V / 3.5A (17.5W) - 3.3V / 2.5A (8.25W) which is a great feature that now days is hard to find on embedded modules. 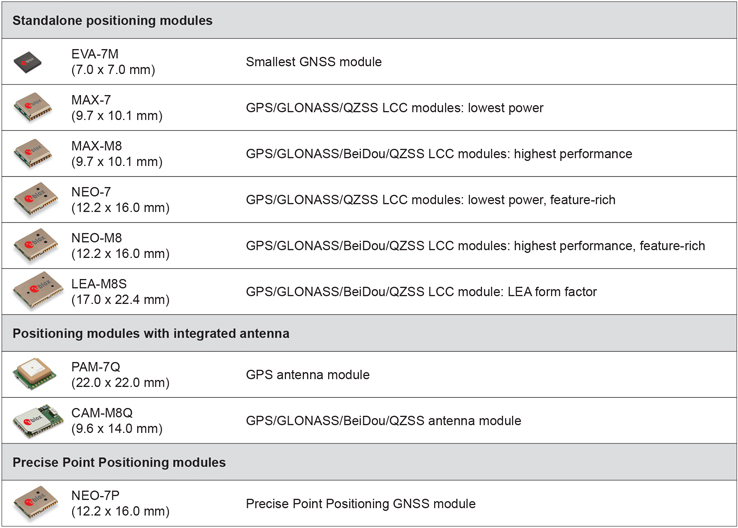 A set of tables listed below, from the U-blox documentation and other made based on it, are the basic information needed to decide the right Gps module for our system. Our interest is only in the Standalone positionig modules and Standalone Positioning Antenna Modules, because Timing and raw data modules, Dead Reckoing Modules and Precise Positioning Modules are for specific application that don’t concern with our goal . GNSS types: Ideally we would like to have at least two GNSS types concurently, GPS and GLONASS/GALILEO/BeiDou. This features will take our system to the next level, giving more # of channels, better acquisiton time and higher navigation frecuency rate. With this the realibity and capability of the system will increase significantly. # of Channels: Generation M8 is the best option compared with past generations (7,6,5) due his two GNSS systems concurrently. Acquistion time: There is not a significant difference between the modules and the times are in the higher standars of the market. Navigation Update Rate: Generation M8 once again is the best chooice. Interfaces: UART is the needy, however USB and SPI are posibilities giving more freedom in terms of design and application. Price: Generations 6 and 5 as can be observed on the table above, are more expensive that the generation 7. Furthemore U-blox recommends don’t use generation 5, old products, for new designs. 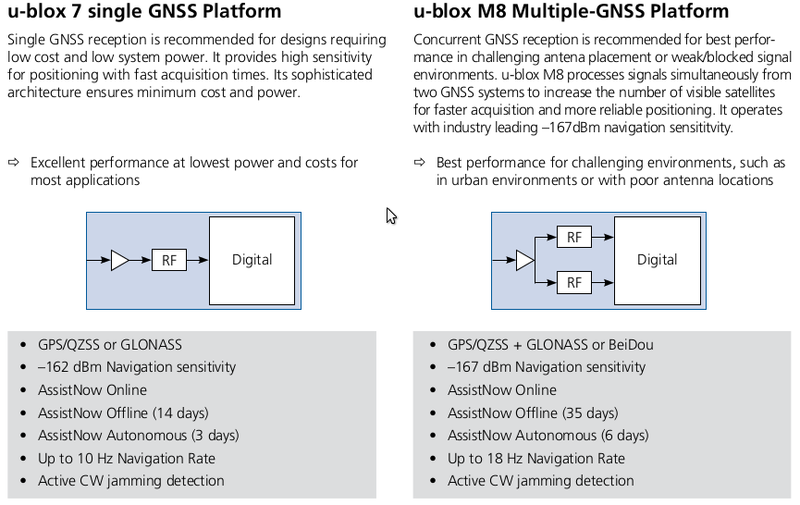 Avaliavility: Generation M8 is not yet avaliable, however is important to note that, U-blox launch this new generation and GNSS module selector overview with the new 8th-Generation GNSS modules on January 2014, for this reason is not possible to get the M8 modules yet, however U-blox “maintain form factor and software compatibility to allow customers to easily upgrade their products with each new generation of u blox positioning modules. The key benefit is simple: customers do not need to keep changing their PCB designs whenever u-blox introduces an improved version of its module products. Simply drop in the next generation module on the existing PCB and start testing!”. This allows us to select one form factor of generation 7 and the replace it for one of generation M8 with the same form factor. The modules UP501(Positioning Antenna) and MAX-M5Q(Standalon position Concurent GNSS)are special because dont not fit with our requirements due has not the funtion of external interrupt/wake up, need it for our system. There are just 3 form factors left after the analysis above, MAX-M8, NEO-M8 and LEA-M8. MAX factor only offers UART interfaces. LEA factor is mainly used for migration from existing LEA designs which is not our case. NEO factor offer more interfaces, more HW capability, addition of Galileo type. But with the drawback of higher supply voltage 2.7V-3.6V, instead of 1.65V-3.6V, however this value is range of our expectations. Finally after the analysis made the GNSS module selected is NEO-M8N. Very nice post! I see you put much taught in the GPS system. Do you already know how you are going to implement the serial connection? We could not find a good library yet and am currently stitching the commands together from arudino examples :P.